Sweet, with notes of dark chocolate, juicy oranges & dark maple syrup. 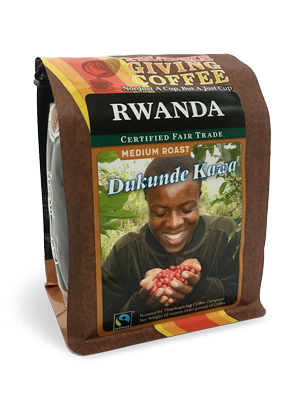 Thanksgiving Coffee got a 92 point review from Ken Davids at CoffeeReview.com for our Medium Roast Rwandan Coffee! "Blind Assessment: Immaculately sweet; lyrical. Peach, honey, lavender and honeysuckle, fresh-cut cedar in aroma and cup. Sweet, high-toned acidity; lightly syrupy mouthfeel. Peach, honey and flowers carry into a crisply sweet finish." "Notes: Rwanda’s tremendous potential as fine coffee producer has only come to fruition over the past several years owing to generous support from international aid agencies, the specialty coffee community and the industry of its growers. Made up entirely of the admired Red Bourbon cultivar and certified fair-trade, this lot comes from the Dukunde Kawa Cooperative; this collection of farmers in known as Musasa, after the areas major town. 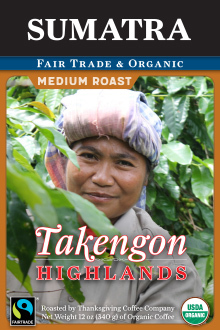 In 2012 Thanksgiving won the SCAA’s Sustainability Award for work they’ve done with this cooperative since 2004. One of the country’s pioneering socially and environmentally progressive roasters, Thanksgiving aimed to combine coffee quality with social and environmental responsibility many years before the latter preoccupations became fashionable." 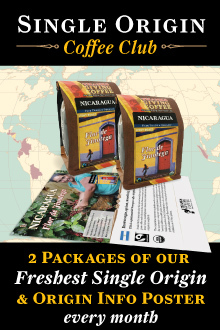 Fair Trade coffee from Rwanda. Available in Whole Bean or Ground: auto drip, french press, espresso or percolator. From Mary Fouts of Pleasant Hill, California on 2/22/2015 . I just ordered this wonderful coffee at the recommendation of Susan Coy, who knows I love light roast beans. Wow! The beans are expertly roasted to bring out the true and wonderful coffee notes. The summary description of the coffee notes is spot on; I will add I taste a delightful and comforting graham cracker note when I drink this spectacular coffee with milk. A forever member of my Favorite Coffee Bean List. Thanks Susan! When opening the package of whole beans the Musasa Rewanda coffee beans are aromatic with a rich nutty roasted smell. The coffee beans look slightly darker than a medium roast and are somewhat oily. The Musasa Rewanda whole bean coffee was brewed with a French Press and it was tasted with and without half and half. The Musasa Rewanda has a deep roasted, nutty smell when brewed. Musasa Rewanda is rich tasting with a great combination of smokey flavor with vibrant tones of chocolate and layers of sweet fruit flavors. There is a nice aftertaste that lingers, making this coffee a pleasure to taste each time you drink it. This is a full-bodied medium roast coffee that tastes fantastic and makes you glad you are a coffee drinker. Musasa Rewanda is ideal for your everday coffee or to savor over the weekend. I highly recommend Musasa Rewanda whole bean coffee as a daily coffee you’ll enjoy drinking again and again. 12oz Bag: $1.38 an ounce. 5lb (80oz) Bag: $1.18 an ounce.